It's not a secret that I'm sort of obsessed with mascara. It's my one beauty product that I constantly switch up and never question splurging for. I've tried so many different mascaras and I have several favorites by now, but I can't seem to stick with any one tube. I've been using Buxom Lash Mascara from Bare Escentuals off and on for a few months now and I just keep coming back to it. 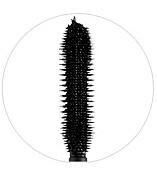 The brush and formula give me the exact lash look I love; long, dark, full, and separated. Pair that up with a great lash primer for an absolutely winning combination. If you like a similar lash look, I really recommend giving this particular tube a try.